We formed Brooklyn Bead Collective in the fall of 2018. After taking an evening beading class together in the spring, we both went home inspired to make more things. Pretty quickly, we realized we wanted this to be more than a hobby for ourselves and needed to justify all the beads we were buying. We wanted to have an outlet to share our creations but also a way to collectively do it together and bring other designers on board who share a similar passion. We’ve shared the journey of friendship and motherhood for many years and are excited to embark on this new venture together and look forward to building the collective as we go along. 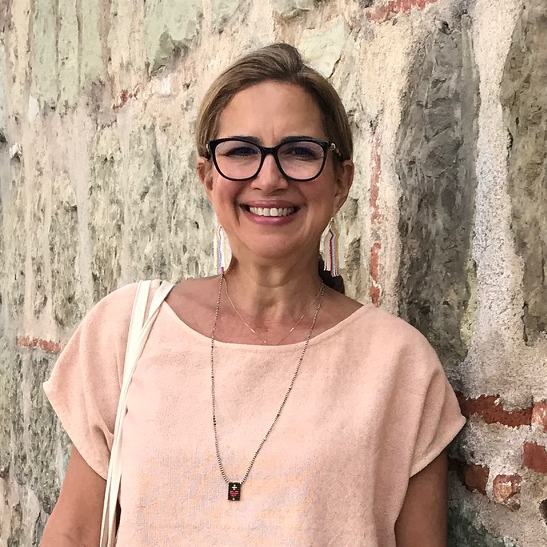 We are thrilled to have Maribel join us as one of our first featured designers as we have both worn and been inspired by her creations for a long time. Thank you for visiting and supporting our small Brooklyn based, mother owned shop! SaSaDi grew up in the mountains of Colorado. Her mother was a seamstress and artist so she spent plenty of time playing with needles and thread and dabbled with beading at some point but it wasn’t until the spring of 2018 that a chance beading class with friends inspired a new passion. Prior to beading SaSaDi worked in retail and wholesale in the fashion and jewelry industry. A year after she had her first son in 2006, she opened Bump Brooklyn with a friend. She had three more babes in the process and then decided it was time to move on from maternity in 2015. She’s an ambassador for Every Mother Counts and has run and fundraised for them over the years. She’s excited to have a new way to give back and help mothers everywhere with the sale of her jewelry. She lives in Brooklyn with her husband Ade, and children Ethan, Zachary, Alexander & Isabel and is grateful for this community of friends. After graduating from Smith (in music), Amy worked in the art departments of Glamour and House Beautiful, studied at the French Culinary Institute, became the pastry chef at Matthew’s in Manhattan, then a senior food editor at Martha Stewart Living. After the birth of her twin sons, Amy and her sister Lauren created and launched Mr. Tiny, a kids' clothing line. More recently, Amy photographed Candy Aisle Crafts and Paper Good Projects for crafter extraordinaire Jodi Levine of Super-Make-It. Amy is also a public education activist and has been very involved in her children’s public schools. Amy lives with her husband Adam, her twin sons Owen and Oliver, and daughter Bea, in Brooklyn. Born and raised in San Juan, PR, Maribel studied design at Pratt Institute. After a 15 year career as an art director working primarily in the home fashions industry, Maribel took time off to raise her twin boys, that’s when she got interested in bead weaving, mostly as a way to channel her creativity. Now, 10 years later, she has a small jewelry line that she designs and produces out of her Brooklyn studio. In her work she continually uses her fine art, design and cultural background to create unique combinations of color and texture for her designs. Each piece is handcrafted with great care and attention to quality. Maribel lives in Brooklyn with her twin sons, Jack and Lucas and with her husband Pat.